Escape Room is a movie best described as tense, fun, and bad in a good way. 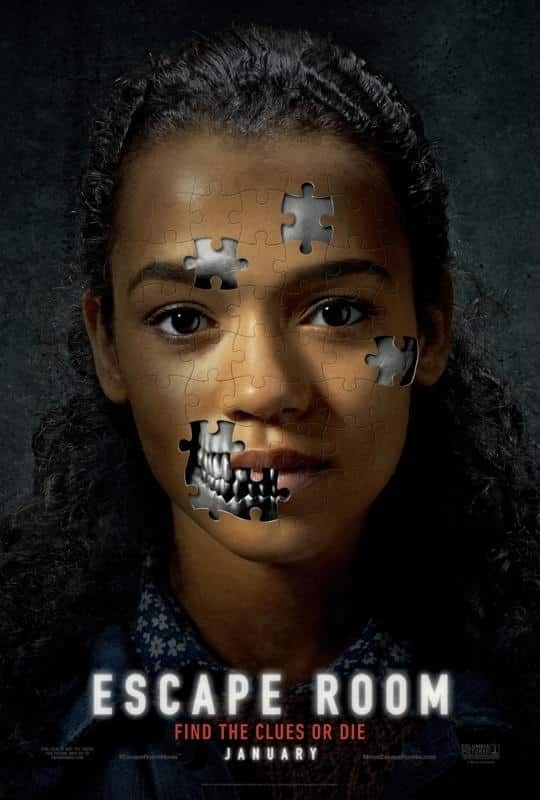 Escape Room is a thriller about a group of strangers who are brought together by an unknown presence that sends out a puzzle to each of them. When they complete the puzzle, it gives them an invitation to compete in a new, premier escape room in their area. The invitation claims that if they beat the escape room they can win $10,000! What they don’t know is that they are playing for their lives! It’s is fun, funny, and terribly written. The dialog is laughable and made up of constant exposition about what is happening at any given moment is what makes this movie laughable. The bones of this movie are decent, and it’s pretty much exactly what I expected. Mostly I had such a fun time watching it with Bryce and being exasperated at the silly dialog that Escape Room ended being more fun than I expected it would be. Escape Room starts out by introducing us to the six narrators of the movie. I say narrators because every single action taken by every character in Escape Room is narrated with gusto by at least one of these six main characters. Of the actors in Escape Room the two that you will probably notice the most from other projects are Amanda (Deborah Ann Woll) who you might remember as the redhead from True Blood, and Mike (Tyler Labine) who is Dale from Tucker and Dale vs. Evil. Tyler is also a producer on Dale and Tucker. One of the main character’s is Zoey (Taylor Russell) who I recognized from the recent Netflix show Lost in Space. Everyone else is an up-and-comer. So, everyone gets the invitation and shows up to what they believe to be the lobby of the escape room. Turns out the lobby is the first room they have to escape, and quickly turns into an oven. They make their way through six successive escape rooms as their numbers are thinned. The one constant throughout all of the movie is that they are being watched by cameras that are set up throughout every escape room. The creators of the escape room use these cameras to monitor the subjects and broadcast the feed of human misery to nameless viewers on the web. The biggest problem I have with Escape Room is actually a bit of a strength for the movie – the laughably bad dialog and exposition. Everything in this movie is narrated by the characters; every action, every thought, every single part of this movie is narrated. It was bothersome at first, but then became so ridiculous and so dependable, it became a companion of sorts for me throughout the movie. I was able to look over at Bryce and see him roll his eyes and laugh every 10-15 seconds, and that was terrible and great at the same time. This movie is not disjointed and hard to follow like Slenderman, it’s the opposite. It’s so easy to follow and so heavily narrated that it becomes a joke in and of itself. Actual problems that stood out to me in this movie were some of the puzzles that the participants had to solve to beat the rooms. These puzzles were (sometimes) so specific to a single character’s personal trauma that only that character could solve the puzzle. So, it was movie kismet that happened to allow the participant who won the escape room to actually get through the whole thing. The plot premise on Escape Room reminded me quite a bit of the plot premise of Unfriended: Dark Web. A shady dark web group is paying to see fucked up things happen to unwilling participants on the internet. Many have said that it’s similar to Saw – sure, that works too. Overall, Escape Room was a tense, goofy thriller that had a few uncomfortable moments, but never anything bordering on “scary”. Going into this movie I was expecting the worst but ended up having a good time because of the way it was written and some fun acting. Escape Room is a fun enough movie, but it’s nothing special. Watch it with friends and you will have a good time. Watch it alone at your peril. The director of The Prodigy is reworking some scenes because they were supposedly too scary. I just hope they leave enough scares in! Check out this article written by Emily Von Seele for Bloody Disgusting about how everyone keeps trying to call horror movies anything other than “horror”. Listen to the podcast to hear our take. Also, check out what Bryce thinks about the question. What Counts as a Horror Movie?